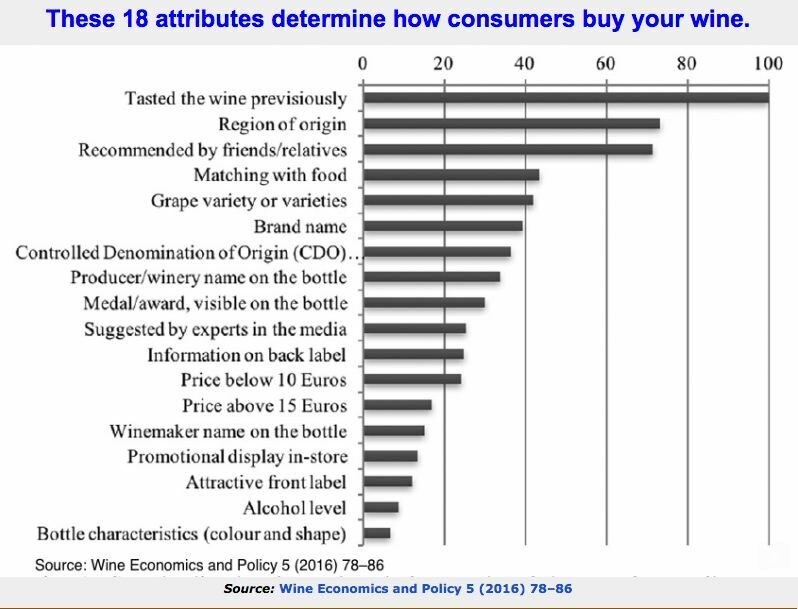 Pinot Noir Searches on Wine-Searcher at All-Time High Wine-Searcher’s David Allen MW reported at the Pinot Noir NZ Conference in Wellington, New Zealand, held January 31 to February 3, 2017, that more than 13 million searches were made for wines produced from Pinot Noir on the Wine-Searcher website. The majority of these searches were for wines from Burgundy, but 16 percent of searches looked for California Pinot Noir and 5 percent were after those from Oregon. Poor Correlation Among Wine Critics’ Quality Scores David Morrison, author of The Wine Gourd Blog at www.winegourd.blogspot.com examined a direct comparison of the quality scores from respected sources of advice, including the Wine Spectator, the Wine Advocate, the Wine Enthusiast, Wine & Spirits Magazine, and Jancis Robinson, along with a few less familiar sources. Morrison used Penfolds Grange Bin 95 and compared the quality scores of the various wine critics over a long series of vintages. He concluded that in general, consensus agreement varies from 0-50%, so that critics disagree more than they agree. Revelations About Current State of North Coast Higher-End Wine Jeff Quackenbush published an article in the North Bay Business Journal, February 21, 2017, in which Bill Rodda, managing director of agribusiness for Santa Rosa-based American AgCredit, and Dan Aguilar, a veteran wine banker, spoke about consumer’s thirst for higher-end wine in the North Coast and the intensifying demand for sources of capital. In the North Coast, demand for vineyards continues to be strong and vineyard values have gone up 10-15 percent in the past year. Records were set in Sonoma County for value of Pinot Noir acreage when a pension fund deal was consummated in Annapolis for $170,000 an acre - probably the top end at present. Wineries continue to attempt to secure their grape sources by buying vineyards and much of what’s available has been purchased by the large wineries such as Gallo, Jackson Family Wines, Vintage Wine Estates and The Wine Group. Increasing vineyard and winery values are driven by the fact that regulators are not approving new vineyard sites and production facilities. Although there continues to be significant demand for existing and new winery companies to get approvals to build production facilities and tasting rooms, it is difficult to obtain approvals in Sonoma and Napa counties. Napa is nearly planted out and Sonoma County is not approving hillside vineyards while much of the flatland is already planted. Website Devoted to Women Winemakers Lucia and Jack Gilbert, professors at Santa Clara University, maintain a website, Women Winemakers of California, listing women winemakers: www.womenwinemakers.com. They offer a searchable resource that introduces the talented women winemakers in California, providing the most comprehensive and accurate information currently available on women winemakers in California. 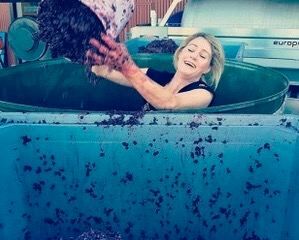 The website also offers information and links regarding women who are winemakers in the United States other than California. 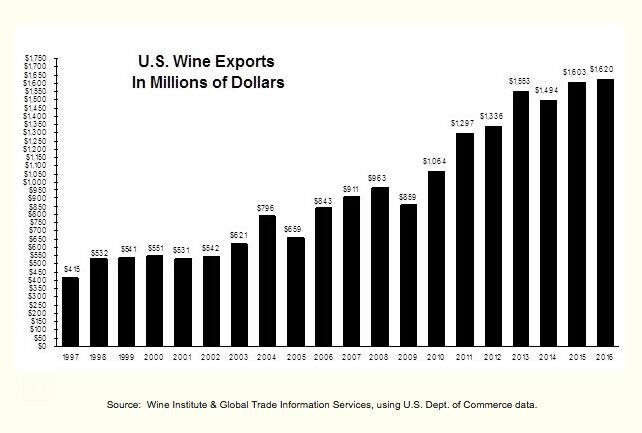 U.S. Wine Exports Reach Record $1.62 Billion in 2016 California accounted for 90% of the record U.S. wine exports. California wine exports have grown 78% by value in the last decade. The top 10 export markets for California wines are the European Union’s 28-member countries, Canada, Hong Kong, Japan, China, Mexico, South Korea, Switzerland and Singapore. Pinot Noir Vinified Like Coca-Cola At the recent Oregon Wine Symposium, Michael Davies, executive winemaker at A to Z Wineworks in Newberg, Oregon, said that he seeks to minimize vintage variation in A to Z Pinot Noir, because “even if its effects on a wine are interesting, no one’s explaining those effects to buyers in the supermarket.” He claimed that the average supermarket buyer isn’t paying attention to the vintage of a supermarket wine. His assumption is undoubtedly correct, but A to Z Pinot Noir is a quaff intended for the supermarket buyer intent on buying inexpensive wine, so it falls into the category of Coca-Cola which is often discounted and consistently the same. Vintage does make a BIG difference in Oregon, and this fact should never be forgotten in marketing and promotion of Oregon Pinot Noir. Adelsheim Vineyard Announces New CEO Joth Ricci, an Oregon native who has recently been the President of Stumptown Coffee Roasters based in Portland, Oregon, and a beverage industry veteran, is the new CEO, taking over for Founder and President David Adelsheim. Ricci will assume all the day-to-day operations but David will still have an active role within the winery and continue to shape the winery’s legacy. He will continue to serve as Chairman of the Board of Directors with Lynn and Jack Lynn Loacker, who joined as partners in 1994. Adelsheim Vineyard is committed to staying independently and locally owned. Pinot Noir $52.00 and over - 2014 Argyle Knudsen Vineyard Spirithouse Dundee Hills Pinot Noir, $55.00. 2014 Lazy Creek Vineyards Anderson Valley, $58, and 2013 Amphora Peters Vineyard Russian River Valley Pinot Noir, $55. Unfortunately, most of these wines will sell out quickly. Also check the Double Gold Medal and Gold Medal winners at www.winejudging.com. Avalon Wine Inc. is a Good Source for Oregon Pinot Noir Avalon Wine was based in Corvallis, Oregon, for many years (dating back to 1987), but Marcus Looze and partner acquired the business and moved to Portland in November 2013. The official name of the company is now Avalon Wine Inc. but because the previous owner did not trademark www.avalonwine.com, the new website is www.northwestwine. com. The store and website is currently offering the latest releases of Lingua Franca Pinot Noir and Chardonnay, a new project launched by noted sommelier Larry Stone, Burgundian Dominique Lafon and winemaker Thomas Savre. Honest Talk About My Scoring It may seem at times that a majority of wines I review score 90 or above. I want to explain some reasons for this. There are some wines submitted for review that in my estimation are not deserving of high scores, so rather than impugn the reputation of that winery, I do not publish the reviews for those wines. I believe that other critics may find the wines more deserving and these wines may find an audience elsewhere. Frankly, readers of the PinotFile are not going to seek out these wines anyway. Secondly, the level of Pinot Noir winemaking is so exalted these days that a majority of wines submitted for review are extremely desirable. Thirdly, I buy some wines from wineries that are not submitted for review but that I believe represent superior examples of domestic Pinot Noir - cherry picking if you will. Finally, the overwhelming majority of Pinot Noir wines I review fall into the ultrapremium category and one would expect them to receive the recognition they deserve.